Born in 1945, Barbara Kruger is an American conceptual artist/designer. After attending Syracuse University and Parson’s School of Design in New York, Kruger obtained a design job at Condé Nast Publications. Working for Mademoiselle Magazine, she was quickly promoted to head designer and later worked as a graphic designer, art director, and picture editor in the art departments at other publications. Layering found photographs from existing sources, with pithy and aggressive text Kruger's work involves the viewer in the struggle for power and control that her captions speak of. 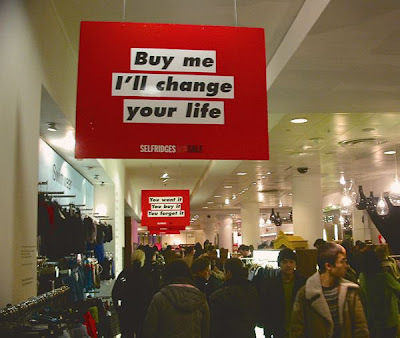 In a trademark style of black letters against a red background, some of her instantly recognisable slogans read “I shop therefore I am,” "Buy me I'll Change Your Life" and “Your body is a battleground." Much of her text questions the viewer about feminism, classicism, consumerism, and individual autonomy and desire, although her black-and-white images are culled from the mainstream magazines that sell the very ideas she is disputing.